Current events? Actually, the excerpt paints a picture of the political climate during John Adam’s tenure as president of the United States and is the lead paragraph of a book review from the Christian Science Monitor of Friends Divided by Gordon S. Wood. The book tells the story of “the remarkable, stormy friendship of Thomas Jefferson and John Adams“. Although these two men played integral roles in the founding of the United States and the progress of the early republic, they became political foes after two bitterly contested presidential elections, Adams aligning with the Federalists and Jefferson the Republicans. In 1812, however, fellow founding father Benjamin Rush urged the two men to reconcile for the benefit of the nation. 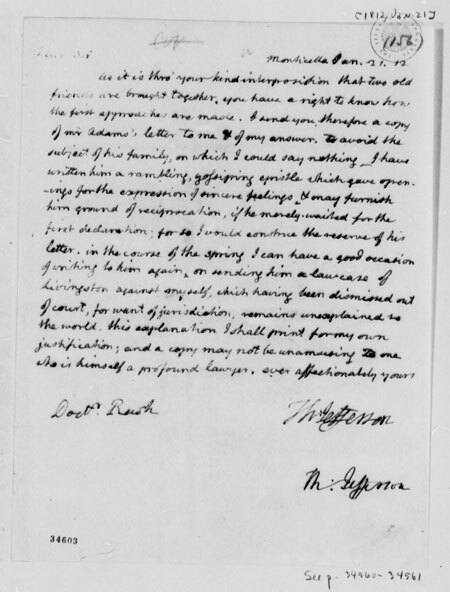 Adams and Jefferson acceded and corresponded with one another for the next 14 years until their deaths, both on July 4, 1826. Read the articles, listen to a podcast interview with Wood, then delve into the correspondence between Adams and Jefferson to see what foundational lessons in democracy and civil discourse you can gain from the primary sources authored by these two founding fathers.